While the weather in Central Kentucky this spring has been anything but “spring like,” we can expect next year’s spring in the Midwest to be pretty heated. That intel came with an April 11 press release that announced Oaklawn Park will “extend” its 2019 meet three weeks past its traditional close with the Arkansas Derby (G1) and will run through May 4. While this year’s meet ran from Jan. 12 to April 14, next year’s stand is slated to begin Jan. 25, with roughly the same number of days. This year’s meet ran 55 programs; next year’s has 57 penciled in. 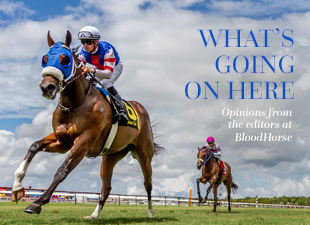 The move is a brilliant one by the track, headed by president Louis Cella, dropping racing early in the year when the weather is a bit dicey—and icy—to run dates during the best weather of the year. At first blush this figures to take a swipe at Keeneland’s race meet, which has commanded two weeks of non-interrupted attention in the Midwest when Oaklawn closes up shop. In actuality, it might ding Churchill Downs the most, taking numbers of runners from its opening three weeks in early May as a good number of horsemen could remain in the Hot Springs, Ark., area before heading toward Louisville. While the horse population will shift, the move appears to be a win-win for horsemen and owners. The Oaklawn stand this year offered $525,127 per day. To push that money later into the season, where Keeneland is running for more than that per day, makes a whole lot more money available. Trainers young and old are weighing in. Will VanMeter is a rising talent in the training game. The son of VanMeter/Gentry sales’ Tom VanMeter and a former assistant to Hall of Famer D. Wayne Lukas, the younger VanMeter sees opportunity. “The clientele that has traditionally wanted to run at Keeneland…they are going to make sure their horses are there,” he said. “The people that want to run at Oaklawn will stay there to compete. Lukas, who has been stabled at Oaklawn for years during the winter months before moving to his traditional Barn 44 at Churchill Downs, sees the allure of staying a little longer in Arkansas. “There is no more beautiful place than Arkansas in April and May,” The Coach said. “And Oaklawn’s purse structure is so strong. It will be difficult to top. For example, a trainer can now run for a maiden special weight purse of $82,000 at Oaklawn or $47,000 at Churchill Downs. That’s a strong incentive to hang around. “Also, if you have a horse that is a little ‘less-than’ talent-wise, you will probably stay at Oaklawn. The prestige of Keeneland is a great draw; let’s be honest, the racing at Keeneland is tougher. As for the shift in the schedule affecting other tracks, Lukas sees pressure being applied to tracks such as Prairie Meadows in Iowa (opens April 26 this year) and Lone Star Park (opened April 19). Whatever happens, if it adds more opportunity for owners, we’re all in. As for Lukas, he’d like to see more racing in Hot Springs. Perhaps we’ll see that in 2020.